I have lived in Dungog for 8 years, moving from southern Sydney. I grew up with a creative mother and a sister who quickly surpassed mum with her sewing skills. Gradually I came on board with sewing and all things creative for which I’m eternally grateful! Sewing and a love of textiles are inspirational to me. In the last two years I have become a member of Dungog Artisans with a central gallery in Dungog. Together with about 30 other local artisans I’m lucky enough to exhibit my textile range and gain inspiration from these talented individuals. 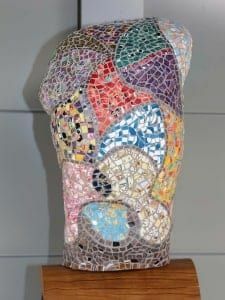 This is my first sculpture exhibition and my most ambitious mosaicking project to date.